Our fishing clients are having a fabulous summer so far with lots of catches reported. We have had clients fishing on a variety of rivers and lochs including the River Tweed, the Tay, the Spey and many many more. With lots more clients in bound over the next few weeks we are hoping for a record summer. We have several clients with us this week who are having a wonderful time although the fishing has been challenging due to a very un-Scottish problem… too much sunshine! We still have good availability for September and October. The best beats on the River Tweed are getting booked up quickly so be sure to get in touch with us soon to give yourself the best chance to access the best possible . The Scottish Borders are home to a wealth of excellent accommodation options, quaint towns and historic monuments and when combined with fishing on the River Tweed provide a Scottish holiday experience that we guarantee will stay with you for years to come. 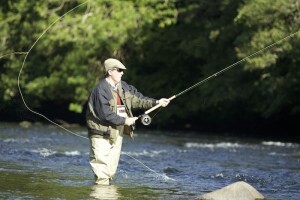 At River & Green we are experts in combining country sports activities so if you are looking to combine your fishing on the River Tweed with a few days pheasant and partridge shooting and perhaps a round or two of golf then we have years of experience and will be able to create a tailor package that exceeds all your expectations. With Scotland being a relatively small country, it is possible to see a lot of the country in a relatively short space of time. If you would like to combine your fishing on the River Tweed with stag stalking in the highlands or fishing the limestone lochs of the northern coast then we would be more than happy to create an itinerary to allow you to do exactly that. Simply let us know what your ideal tour of Scotland would include and we will create an itinerary to match. To book your Autumn fishing on the River Tweed or to book a longer tour of Scotland get in touch with us today, now is the perfect time to start planning.